Google Wallet, the company’s NFC-based virtual wallet for Android, got a major update earlier this month when Google started giving its users the ability to use cards from Visa, MasterCard, American Express and Discover. Today, Google and Discover announced that they are now making it even easier for Discover customers to save their cards to Google Wallet. Discover now uses Google’s Save to Wallet API to allow its cardmembers to save their credit card directly to their Wallet account from Discover’s online account center. This is the first time a major credit card company is using this feature. Currently users have to type in their credit card number on their phone or on the Google Wallet website. With this tool, Discover users just have to sign in to their regular credit card accounts, find the Google Wallet “Add Your Card” button and sign in to their Google Accounts. 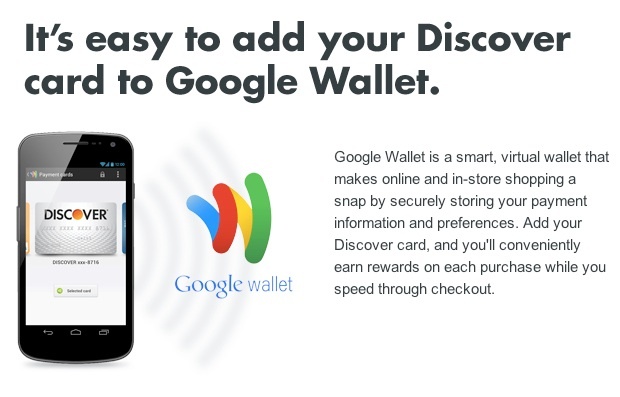 Discover then securely transmits all the information to Google Wallet and you’re done. Discover is one of the smaller credit card companies in the U.S., but given that mobile payment systems and virtual wallets are still a bit of a novelty in the U.S., this will surely raise the overall awareness of mobile payments and also a few new users to Google Wallet. Most users, after all, log into their credit card accounts at least once per month to pay their bills and if Google manages to partner with other major credit card issuers as well, this API could turn out to be quite a boon for Google Wallet (especially in the face of the increasing competition in this market). It’s also good to see that Google is working directly with the credit card companies. When Google added American Express to Google Wallet, after all, American Express had never officially signed off on the partnership. In today’s announcement, Google also notes that since launching support for all the major credit cards, it has “seen a significant increase in signups and app usage as people have loaded all their cards into Google Wallet.” This doesn’t come as a surprise, given that Google Wallet only worked with CitiBank-issued MasterCard cards before, but Google hasn’t provided any concrete numbers for Google Wallet usage yet, so it’s hard to gauge how successful the program actually is.